It is thick. Thick hair can act as insulation keeping the bee warm in cold weather. 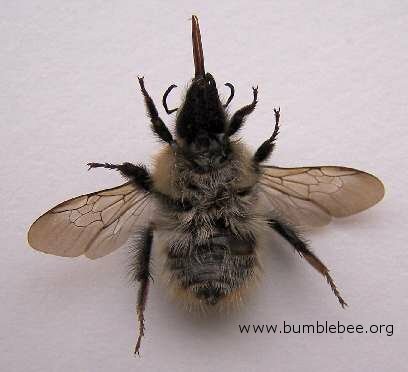 As you can see above showing hair from the back of a bumblebee, and below the abdomen of a Bombus pascuorum queen. 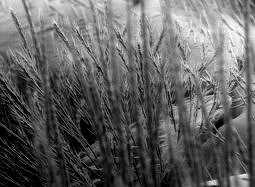 It is branched allowing better pollen gathering. warningly coloured protecting it from predators. 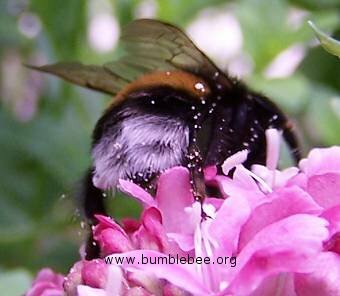 Thick hair enables bumblebees to forage and pollinate flowers on days when it is too cold for honeybees. This makes bumblebees very important pollinators of fruit in colder climates, for example on the Scottish raspberry crop and on Scandinavian fruit crops. 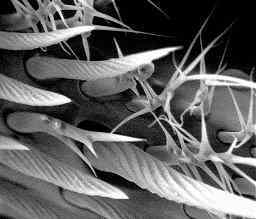 The other adaptation of the hair is that many are branched or feathery enabling more pollen to stick to them, as can be seen in the scanning electron microscope images (SEM) above, and below. 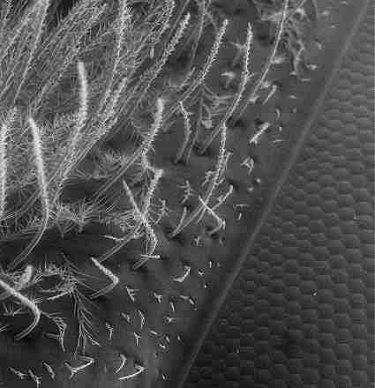 When flying a bee builds up an electrostatic charge, the parts of a flower are usually well earthed, the stigma (the bit that leads to the ovary) more so than other flower parts, so as the bee enters the flower the pollen is attracted to the bee's hairs and even grains of pollen that are not touched by the hairs can jump a few millimetres to the nearest hair. When a pollen covered bee enters a flower, because the stigma is better earthed than the other parts of the flower the charged pollen is preferentially attracted to it. 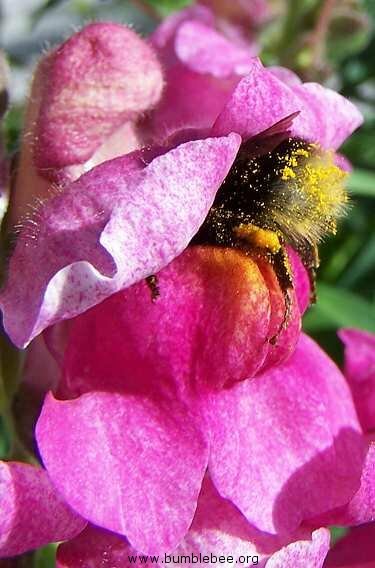 So even if the large, hairy, bumblebee fails to brush against the stigma, the pollen can jump the few millimetres necessary for pollination. 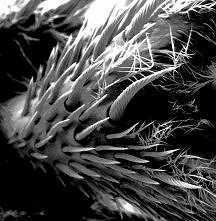 The image above shows the branched hairs between the eyes of the bumblebee. You can see the typical hexagonal facets that make up the compound eyes of many insects. he bumblebee's sense of touch is mainly conveyed through receptor cells located at the base of the variously shaped hairs and spines located all over the bee's body. This give the bee information on the direction and pressure of the impact. 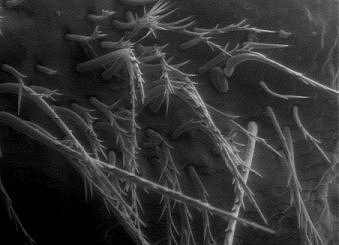 Some hairs may also be sensitive to sound waves. As with most insects there is a great concentration of sensory hairs on the antenna, and especially at the junction of the pedicel with the scape (the elbow). Bumblebee hair colour makes them very noticeable. They have the typical warning colours of yellow and black. This protects them from being attacked. A bird or mammal need only be stung once by a black and yellow insect to know better, and to learn that black and yellow things are not to be messed with. This works so well that many insects are this colour, not just bumblebees, such as wasps, hornets and even poisonous caterpillars. This is called Mullerian mimicry, after the man who first wrote about it. There is another kind of mimicry and that is called Batesian mimicry, also named after the person who first explained it. This is when a harmless species mimics the protective colouring (or other type of protection) of a harmful species. This can be seen in some hairy hoverflies which mimic bumblebees. These hoverflies have no sting, and cannot bite, but because they look like bumblebees, and some of them also buzz like bumblebees, they escape a certain amount of predation. Above you can see more hairs and bristles from the tarsus (the small leg segments just before the claw). Note how there are fewer feathery hairs and more stronger, spirally ridged hairs. These are used to comb through the body to gather the pollen and also to remove any debris. The image on the right is at higher magnification. Link to full sized images 1, 2.